A few months ago, I was alerted to a type of Malaysian bread that I’d never heard of before, called roti canai [RO-tee chan-EYE]. As I’ve mentioned before, I dearly love discovering new breads, and am constantly amazed at how much variety there can be from such few and humble ingredients. Though I’ve never been to Malaysia, or had the opportunity to have real roti canai, this beloved bread seems to be exactly the type of bread I crave: flaky, chewy, crisp-edged, and lightly charred for notes of smoke. Roti canai inspires a great deal of fond remembrances from expat Malaysians and tourists alike. 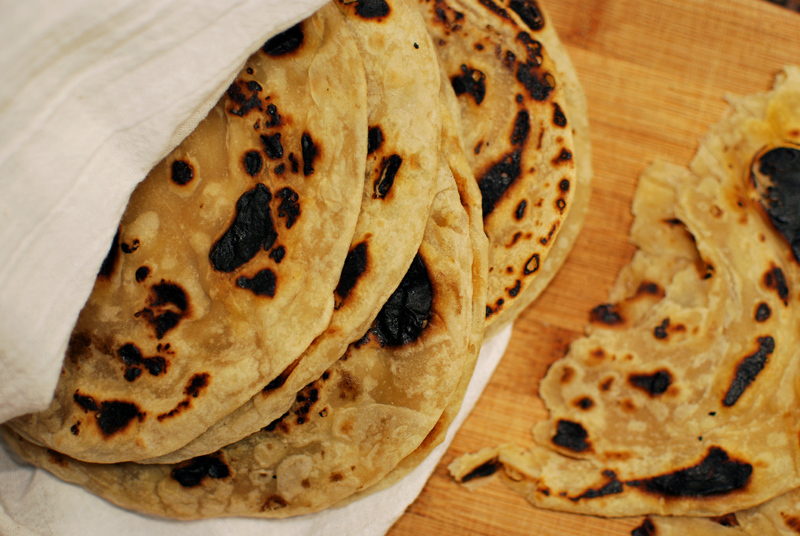 Served mostly from the ubiquitous Mamak food stalls, these flatbreads are served either plain or with any number of ingredients mixed into the dough. When plain, they are usually round, but when filled, they’re more often square, due to the folding process. Their widespread popularity stems from the fact that they can comprise a whole meal, and don’t require utensils to eat, which also explains their popularity as a late-night snack or breakfast. The typical method for making this bread involves a practiced series of flipping and stretching the dough to tissue-thickness, as seen here; it’s a method that I didn’t even bother to try on my own, though it does look like fun. Instead, taking a cue from a few roti canai recipes I ran across, I’ve used a system of flattening, buttering, rolling up, and flattening the dough again. 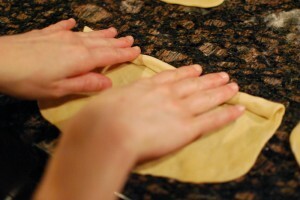 A very similar technique was employed when I made ensaïmadas some time ago, except that roti canai are flattened a second time. The result might not be wholly authentic, but it was absolutely delicious. Tender inside, and the thin outer layer crisp and slightly charred, it was a perfect match for a simple curry, but would be just as good with anything from soup to a fried egg. The flavor is mild enough to match whatever you like, but it’s so delicious that you’ll want to serve it with everything. 1. In a large bowl, whisk together the flours and salt. Drizzle in 2 ounces (1/2 stick) of the melted butter, and toss or rub in until absorbed. Add the water, and stir until a rough dough forms and all flour is moistened. If dry spots remain, add additional water by spoonfuls until there are no more. 2. 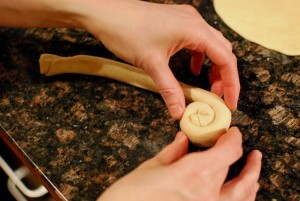 Turn out onto a work surface, and knead until smooth and elastic, 3 to 5 minutes. Cover with plastic wrap, and let rest for at least 1 hour, and up to 3 hours. Alternatively, the dough may be wrapped tightly and refrigerated for 1 day. Bring to room temperature for 30 minutes before proceeding. 3. Divide the dough into 12 equal pieces. Roll into roughly round balls between palm and counter, flatten slightly, and set aside, covered loosely with plastic wrap. Let rest for 15 to 30 minutes. 4. Using a rolling pin and your hands, roll or press each ball of dough until flat, dusting with only as much extra flour as needed to prevent sticking, or use a little melted butter on your hands. 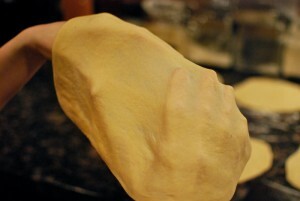 Lift the dough and stretch it until very thin and nearly transparent; or, if you’re confident, try rapidly flipping the dough until tissue-thin, as seen in this video. The dough should be strong and supple enough to easily stretch like this; if it resists, cover and let rest for about 15 minutes. 5. Brush the top of the dough with some of the reserved melted butter, and tightly roll up jelly-roll style into a long, thin cylinder. Coil the cylinder, seam-side down, and pinch the end to seal. 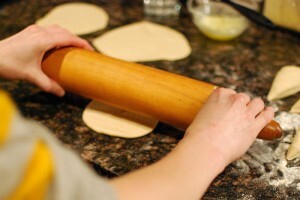 Set aside and keep covered while shaping the remaining dough. 6. Using a rolling pin, and dusting with only enough flour to prevent sticking, roll each coil out to a flat round, about 6 inches across. 7. Heat a nonstick pan over medium-high heat, until hot but not smoking. 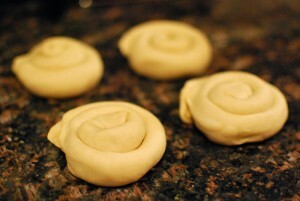 Brush each piece of dough with melted butter, and place buttered-side down in the heated pan. Brush the unbuttered side with butter. Cook for 40 to 60 seconds, or until just beginning to puff and the edges look dry, then flip dough over. Cook for an additional 30 to 45 seconds, or until browned or lightly charred in spots. If needed, flip again and cook the first side for a few more seconds until done. Stack cooked roti wrapped in a kitchen towel to keep warm until serving. 1. If you don’t have white whole wheat flour, you can substitute a mixture of all-purpose and regular whole wheat flour, combined in equal amounts. i totally want to make these. it’s weird how they are coiled up and cooked but come out flat… THANKS! Tia: I didn’t show a picture of it, as I thought it’d be repetitive and unnecessary, but these breads are rolled out again after being coiled up. That would be a neat magic trick if they flattened out so much on their own! These bread were really delicious, I hope you enjoy making (and eating!) them.